Connecting your Loom and Slack accounts allows for quicker and more collaborative workplace communication. Enabling the Slack integration will allow you to share your Loom videos directly from the video page to the Slack channels/direct messages where you get your work done. In order to connect your Slack account to Loom and start sharing your Loom videos via Slack, you will need to open a previously recorded video. 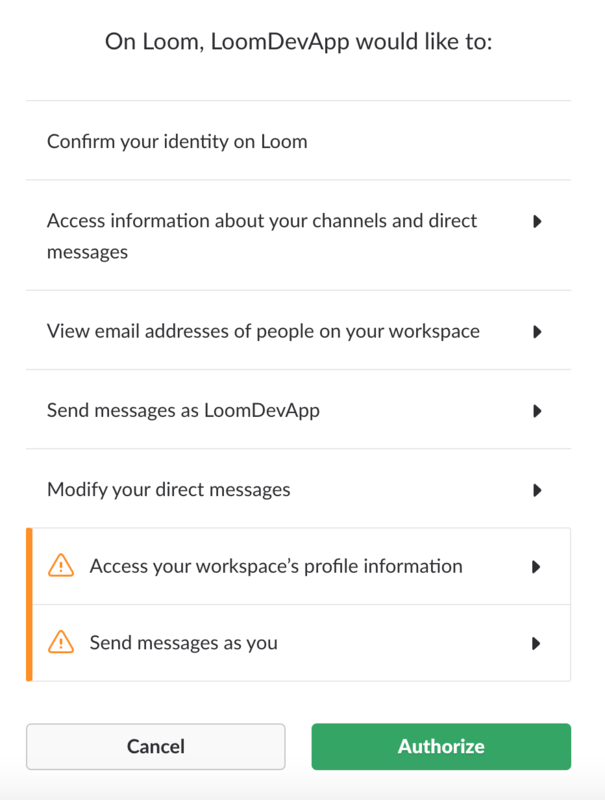 Selecting this option will prompt you to grant permission for Loom to access your Slack account, as a normal Slack application would. Read more about granting permissions below. Scroll down to the bottom of your Account Settings page and click on the green button that says "Connect with Slack". After choosing to connect your Slack account with Loom, you will be redirected to the Slack website. This is where you will be asked to grant permission for Loom to access your Slack account, as a normal Slack application would. Below you can see a copy of the list of permissions Loom would like to access. Once you authorise the connection, your Loom and Slack accounts will be connected and you will receive an email confirmation. You are now able to share your Loom videos directly with your team. Learn all about the ins and outs of this feature in this article. You'll be able to see the Slack Integration on any of your video pages. If you receive a third party login error, it means you may have duplicate Loom accounts. For example, let's say you are connecting your johnsmith@useloom.com account to your john123@gmail.com Slack account. If you also have a Loom account registered to john123@gmail.com, you will not be able to connect the original johnsmith@useloom.com account to your Slack account. You would need to delete the duplicate Loom account before attempting to connect accounts.